Wired for instant access to classic tones without needing a single patch cable, the Synthesizer Block is a complete semi-modular, monophonic synthesizer. The Synthesizer Block is 100% analog and 100% Eurorack compatible with a complete set of patch points able to override the internal audio and CV signal path. 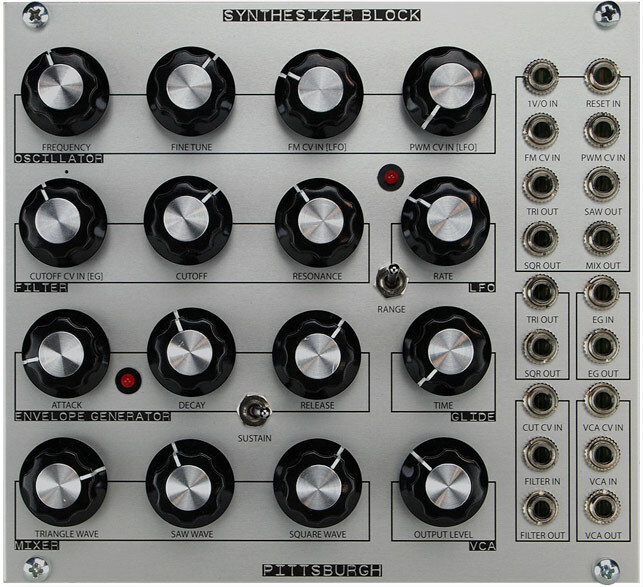 The Synthesizer Block was designed to be the core of any modular system. Each major component is fully patchable and can function independent to the rest of the module. This allows the functionality of the Oscillator, Filter, LFO, Envelope Generator, and VCA to be broken apart and used like standalone modules. Waveform Mixer for Oscillator Outputs. © 2019 pittsburgh modular synthesizers llc.